Like many who work in the Financial District, Lori Pailet heads to work before the sun is up. But instead of jumping into an early meeting at an investment bank or law office, Lori meets her clients poolside for a morning dip. As the owner and director of Aquaskills, she spends her days helping New Yorkers reach their aquatic potential. A former artist and designer, Lori has been sharing her passion for swimming since Aquaskills was founded in the early 2000s. She is driven by a desire to help individuals engage safely and happily with the water. 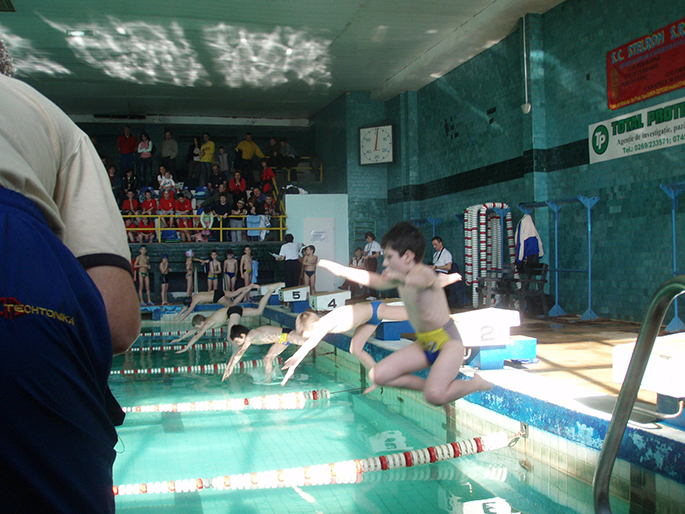 Through her hard work and determination, the school has become a go-to for all walks of life looking to learn to swim for the first time, or refine their technique. Along with a team of trained instructors, Lori offers a wide range of classes and lessons depending on skill level, but specializes in adults who either have aquaphobia or who never even learned to dog paddle. Lori was even featured in a NY Times piece last summer about aquaphobia, the story following drummer Attis Clopton as he overcame his fear of water. We spoke with Lori to find out more on her own journey into the pool, and how she approaches those learning to swim for the first time. Before your pool days, you were an artist and designer. What drew you from creating to swimming? I grew up in Greenwich Village in the 1960s. My mother was an artist. So I grew up in the art world going to Andy Warhol exhibitions. My backyard was Washington Square Park. Being a professional artist was a career goal. I started out my career in fine art; drawing, painting, sculpting. I had about five exhibitions before I was in my 20s in East Hampton, and sold actually to some big dealers and collectors. I liked doing sculpture most of all. It was really interesting because my sculpting had a lot of influence from the ocean and people’s bodies. They were very organic and otherworldly. That worked out until it go too complicated to make art in the apartment. I had a good sense of design and fashion. My mom had been in the jewelry business. So I decided to put together a collection and bring it around. My designs were very pop culture so I would go door to door to mom and pops all over the city and to the New York Coliseum back in the day and trade shows. I was very successful. In ’89, some people broke into my office building and I was attacked. When I was running away, I tore my ACL in the left knee. Both of my knees became very disabled and I spent years in physical therapy. After that, I spent a lot of time in the pool. Why did you decide to become a swim instructor? I moved to L.A. and worked for a decade and a half for an entertainment attorney. I came back to New York and met a guy who had been in the Olympics. We used to swim a lot together, and then we decided to start Aquaskills. We literally walked around the city, door to door looking for a pool, and we eventually discovered Spa88. They are Russian owned and it has a Russian theme—there are Russian dolls everywhere. There was a pool in the back that was underused and we turned it into a swimming school. It started out that he was going to do the teaching and I was going to do the business part of it, but I used to go with him to teach and I ended up teaching. With all of his merits and medals, he didn’t have the patience for someone at zero. I started to work with people and realized a majority of the phone calls coming in were people that didn’t know anything at all about swimming. I thought it would be people looking for finesse. I took a ton of courses in different aspects and studied for years. When I went off to teach, I loved the gratifying feeling of working with people on something that is so intrinsically important. When I saw that people were transformed from this, it was exciting. I like transforming people from land to water and watching them be happy and feel liberated, and seeing it affect all other areas of their lives as well. They are empowered to overcome one fear, there are usually other ones accompanying it. You have a very diverse clientele of beginners. Who is signing up for lessons? We have an average of 40 people coming in each month. 95 percent are adults and out of that 75-80 percent have aquaphobia. It seems to be on everybody’s bucket list to learn how to swim and conquer the fear of water. I’ve been doing this for 14 years, a phone call is usually an older person who usually feels very left out, and wants to open up their lives to a plethora of outdoor experiences from just enjoying pool parties to kayaking and scuba diving. We have retirees, some people that are landlocked New Yorkers who never had a chance to learn how to swim, and people from other countries where it wasn’t promoted during their childhood. A lot of our students are from other parts of the world and are now working in New York. Is it difficult teaching students with aquaphobia? There’s a couple of different approaches. One method is soft, gentle coaxing to get over the fear. But sometimes when you do that with someone with fear, they just get more comfortable and couched into their fear, and they take no chances. Other times I get a little more challenging. I make them do things they don’t want to do slowly. But if you lighten up and you work around fears and don’t make a big deal out of them, and sometimes show your own fears, it’s easier to get someone to feel more comfortable around you. Swimming is best when one is relaxed—that’s how you float. You’ve got to explain to students how to relax. Sometimes we use props such as noodles or a flotation belt in the beginning just so they can become comfortable in the water. But being in water is very similar to being in outer space—there is zero gravity. So you take someone who has been on land all their life and has control and put them in a weightless environment, that frightens them. You’ve got to walk them through it and how to cope with it. But here’s an interesting phone call I recently received: “I’m not a swimmer and I just want to know, are you really cut because I feel really uncomfortable being around people that are in perfect shape.” I say absolutely not, I wear a swim shirt and a pair of shorts. I think the fact that I don’t look overwhelmingly athletic also makes people more comfortable. 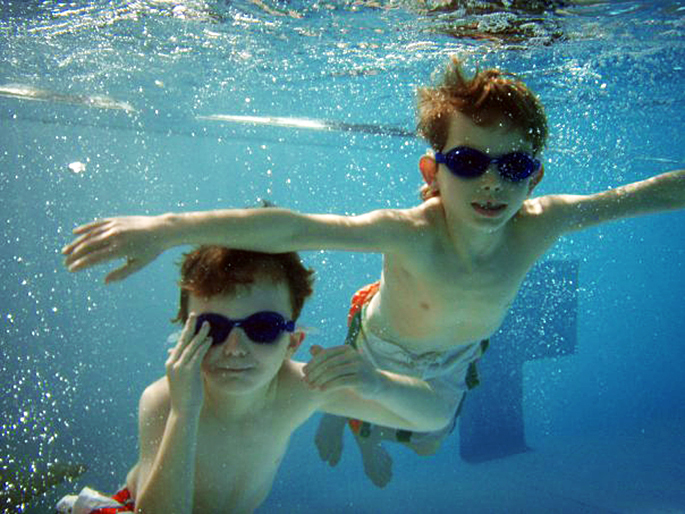 Do some of your students with aquaphobia need more time in the pool? We do an evaluation class so that people can evaluate us and we can evaluate them as well. We don’t make promises that we can’t keep. If someone needs a lot of classes based on their fear, or the way they are responding to instruction, it would fair them better to do a certain number of classes. There is a spectrum of fears. People have had traumatic experiences and for them to get over the hump takes longer than others. Lessons are an hour and there is an opportunity to practice afterwards, space permitting. The reason why Attis Clopton from the NY Times article learned in 10 classes is because he practiced after each class. You don’t want people to think it only takes 10 sessions. Does your background in art and design help with swim instruction? I think that when I am working in the pool, people will say, “You weren’t even watching.” I used to go to art galleries with professional artists and walk in and out of the room, and go in for three minutes and see an exhibition. You start to learn to see things really quickly when you’re trained that way. I can catch form that is off faster than other people because that is what I was trained to do. As an artist that is the goal: to create balance, form, harmony and alignment. The reason I do think I’m successful is I bring a lot of humor to this. I’m very clairvoyant. It surprises people so much when I know exactly which country a student is from or what they do for a living. When I have someone’s hands, I feel the tightness in their hands and I’ll say something like, “Are you a surgeon or do you play piano? Definitely, you are working with your hands.” And they will ask how I know. This is what happens after a while. The body tells all. How much of your day do you spend in the water? We do the morning classes 6 a.m. to 12:00 p.m. I will sometimes go in the morning and then come back up to the office and do marketing, blogging and the phone work. I’m addicted to swimming. If I don’t swim for 48 hours, I feel horrible. It’s in my blood now. After learning how to swim or brushing up on their technique, do clients mention that they find swimming a nice break from the hectic city? Some of the people who take my classes become addicted to it. I have people who have been with me for five years. They just like the program, the instructors, it’s an activity in their lives. I have a lot of repeat customers. Is there anywhere New Yorkers would be surprised to find out there is a pool? There is a pool on 135th street and Riverside Drive called Riverbank State Park. It’s interesting because it was built on a landfill and there was an incredible stench, and the pool never became popular because of that. Then they fixed it and it’s a sleeper. In the summertime, the Tony Dapolito Recreation Center on Carmine Street has an outdoor pool open to the public. It’s absolutely free. On the weekends, it’s very quiet. I find that very nice and refreshing. What does helping New Yorkers reach their swimming goals mean to you? It’s the truth that anyone can learn to swim. I love bringing opportunity to people who haven’t had the opportunity. I like expanding people’s horizons. You can go to the Caribbean, you can get better exercise. Visit Aquaskills’ website to learn more about classes and the organization.